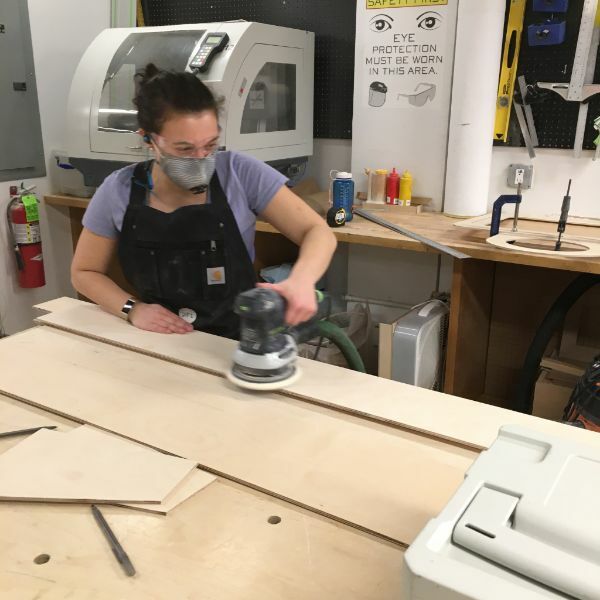 Hannah, an MFA Products of Design second year, is in the shop working on building an interactive installation which will take place next weekend in Washington Square Park. The installation is a large plywood structure on which passers-by will be able to share their thoughts about how they are involved in political discourse. The notes they leave behind will then be sent to the NYC mayor's office. Hannah ripped all of the wood on the table saw with the help of VFL staffer Elizabeth and fellow Products of Design second year Carly. She is using the Festool orbital sander to prep the pieces and keep the shop clean.